Adobe Premiere Elements is a user-friendly asset organization and editing application. It lets amateurs and those new to video editing to create stunning videos and share them with family, friends, colleagues, bosses, and even clients. With Adobe Premiere Elements, users can easily find the clip or photo they are looking for. They can organize them according to various categories for a quick access to a certain type of video and clip. Adobe Premiere Elements also gives users the resources they need to get started. These allow them to learn the ins and outs of the application for them to maximize its use and to enjoy video editing to the fullest. With Adobe Premiere Elements, users spend less time looking for certain clips and photos and more time on editing. The application takes care of sorting assets according to date. And if the user wishes, they can sort them according to favorites and other categories. Adobe Premiere Elements let users create professional-grade videos with its step-by-step guide. This way, those who are new to video editing get to learn the ropes quickly and gain confidence to edit videos without guides. This lets them increase their editing skills and update their skill set. For users who want to fuse two videos together to capture similar moments, Adobe Premiere Elements is around to help. The software comes with an intelligent editing feature that allows users to keep the best scenes in a video. Those who wish they managed to immortalize a moment in a picture can do so by grabbing a still from a video. Adobe Premiere Elements enables this through its Candid Moments feature, so users do not just have a video—they get to keep a photo, too. With Adobe Premiere Elements, users can create animated social posts to share with family, friends, co-workers, and clients or to the public. They can simply add a few embellishments and text or enhance them with other tools. The application even helps in making these videos by automatically selecting the best clips and photos for users to save time in editing. 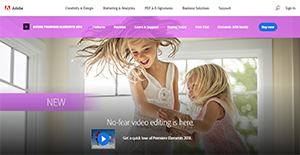 If you are considering Adobe Premiere Elements it may also be a good idea to check out other subcategories of Best Video Editing Software listed in our database of SaaS software reviews. Each enterprise has different needs and requires an application that can be personalized for their size, type of staff members and clients, and the specific industry they are in. For these reasons, no software can provide perfect functionality off-the-shelf. When you search a software app, first be sure what you want it for. Read some Adobe Premiere Elements reviews and ask yourself do you need basic tools or do you need sophisticated features? Are there any industry-specific functionalities that you are searching for? Find the answers to these questions to help your search. There are multiple factors that you need to reflect on and these include your budget, particular business requirements, your organization size, integration requirements etc. Take your time, check out a few free trials, and finally choose the system that presents all that you need to enhance your company effectiveness and productivity. How Much Does Adobe Premiere Elements Cost? Discounts are offered to students and educational institutions. For more details, contact sales through chat or phone. We realize that when you make a decision to buy Video Editing Software it’s important not only to see how experts evaluate it in their reviews, but also to find out if the real people and companies that buy it are actually satisfied with the product. That’s why we’ve created our behavior-based Customer Satisfaction Algorithm™ that gathers customer reviews, comments and Adobe Premiere Elements reviews across a wide range of social media sites. The data is then presented in an easy to digest form showing how many people had positive and negative experience with Adobe Premiere Elements. With that information at hand you should be equipped to make an informed buying decision that you won’t regret. What are Adobe Premiere Elements pricing details? What integrations are available for Adobe Premiere Elements? If you need more information about Adobe Premiere Elements or you simply have a question let us know what you need and we’ll forward your request directly to the vendor.